Dubai Parks and Resorts is the first incorporated indoor theme park destination in the region. It covers 30.6 million square feet, which makes it the largest mega theme park all over the world. This unique and fascinating destination comprises of three outstanding theme parks: Motion Gate Dubai, this park is a movie inspired theme park that is divided into three smaller sections based on Hollywood’s greatest well-known characters including Smurfs and Lionsgate; Bollywood Park Dubai, it is based on five themed zone parks with many inspiring rides and fascinations from Bollywood’s famous classics including Sholay and Don, it portrays the Indian culture through the structures inside this theme park; Legoland Dubai, it is based on its six exclusive theme parks inspired by Lego. It is constructed for tourists and public to experience absolute adventure at this exciting place with over 100 thrilling rides and modern attractions. You can plan your holiday to Dubai and visit this destination to have ultimate fun with your family and friends. 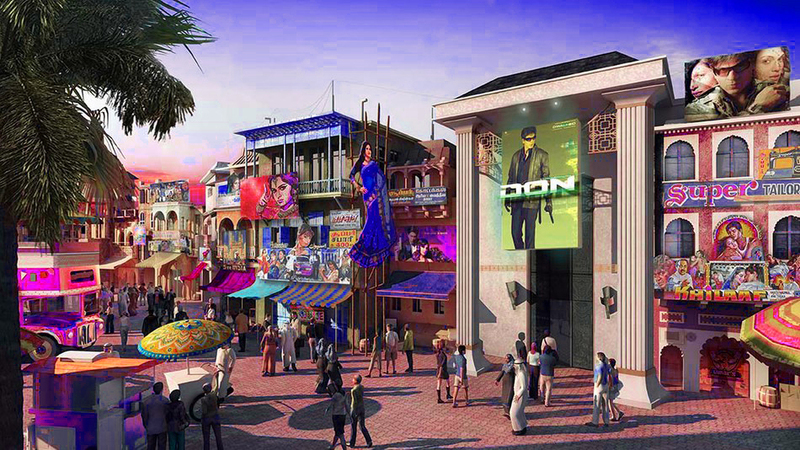 Bollywood Parks Dubai is the only theme park around the world offering an authentic and immersive Bollywood experience. Bollywood Parks Dubai reconstructed the Bollywood experience through its classical attractions and thrilling rides across the five zones: Bollywood Boulevard, Mumbai Chowk, Rustic Ravine, Royal Plaza and Bollywood Film Studios. Experience and enjoy the lively festive of Mumbai’s renowned film industry enthused by Bollywood blockbusters. You can relish live entertainment with catchy songs and dances, stage concerts and flashy rides. This is the only Bollywood themed park in the world’s covering 1.7million square feet every inch feels like a remarkable experience. For the first time you will see, live, observe, learn and experience the psychedelic world in this theme park. While the construction the officials made sure to focus on everything that is being constructed, making everything in the park flawless. It’s a must visit for Bollywood fans and the people who admire and want to explore the Bollywood culture. Butterfly garden Dubai is the World’s largest covered garden constructed with 9 custom homes, a museum with all the butterflies inside and a butterfly flower park. It is located inside the Miracle Garden Dubai. There are nearly 15,000 different species of butterflies. The domes are in a variety of colors and have around 24 kinds of butterflies from numerous tropical states. Dubai Butterfly Garden reveals some insight into these mesmerizing creatures, uncovering energizing certainties about their life which are certain to please every individual from the family. When you enter this park you see the enormous butterfly and insect museum, with thousands of dreamily preserved and well-maintained butterflies on showcase. When you enter the domes you find that each dome is ornamented with flowers and nectar plants as the feed of butterflies. Furthermore, the butterfly glass house will allow you to witness the phenomenal lifecycle of the butterfly species as it experiences the transformation. The butterflies will be of various hues, sizes, and shapes and will fly over a scope of blooms and plants and around visitors. The growing cycle of a butterfly based on the different flowers and the climate situations, it varies between one and three weeks. Dubai Butterfly Garden is a part Miracle Garden Dubai but it requires to purchase a separate ticket. This indoor fascinating themed park is open all year for the public. Each of its domes comprises of 15,000 exotic and mysterious butterflies from places all around the world, including the Philippines, Thailand, and Costa Rica. It gives tourists an exceptional chance to think about the wonders of Mother Nature in an amusingly pacific setting. The butterflies are of the variety of beautiful colors, shapes and sizes, each butterfly with different breed has its own unique and matchless appeal. There are nectar plants which provide feed to the butterflies. 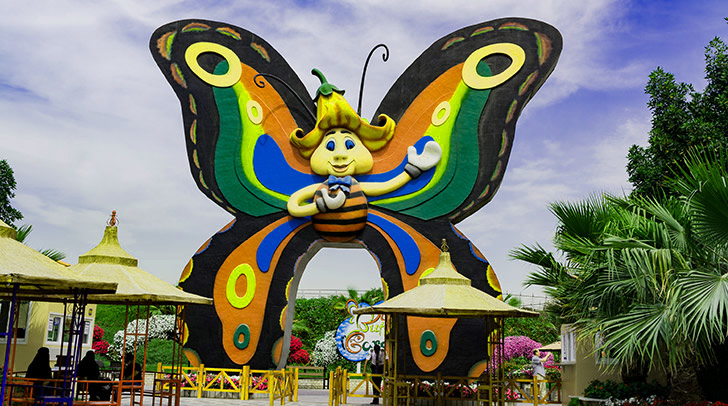 Dubai Butterfly Garden showcases 3D flower projects and different colorful flowers following the theme of the garden. There are also three fish ponds that feature a variety of sizes of fishes in different colors, where visitors can also feed on their own. Visitors can also appeal a visit to the hatching apartment, where numerous pupas are kept by the officials in cases until they hatch and they take almost 7 to 21 days to grow and start the lifecycle. Dubai Butterfly Garden daily opens at 9 am and the last entry of the person is at 6 pm. Global Village Dubai is the country’s greatest shopping field, which opens up each year with a world full of choices. It is the biggest occasional, social party in the region, offering a stunning exhibit of celebrations, shopping and amusement in an outdoors if themed park. Global Village Dubai is professed to be the world’s biggest tourism, recreation and excitement venture, with more than 6-million yearly visitors. It incorporates accumulation of structures, speaking to different nations from around the globe, offering garments, food, hardware, classical things, floor coverings and simply whatever other things, which speak to each culture and nation over the globe. Shopaholics can lay their hands on a plenty of things that are generally modest in the UAE. You can get stuff at less expensive costs here, on the off chance that you are great at bargaining. This diversion and shopping goal is open every one of the 161 days and hosts 70 participating nations, displayed in 36 structures, with in excess of 50 fun rides and 26 eateries offering sustenance from over the globe. Visitors can easily come to this exciting place as it is interconnected to all countries of the UAE by a wide road network. Dolphinarium Dubai in Creek Park opened in 2008 and it is now one of the greatest cherished Dubai tourist attractions. Each unique and irreplaceable tourist attractions in UAE promises that you and your family member and friends will have an exciting day out which you will cherish forever! If we talk about Dolphinarium Dubai over 30,000 visitors visit this place per month. You will have the encounter with the most fascinating mammals. These intuitive spectacles feature the stunning animal’s surprising abilities. Visitors watch in ponder as the dolphins and seals move, sing, juggle, make a move, go through the motions and even paint. There is a Creek Park Bird Show, the main outlandish winged animal show in the area. Our shows are an activity stuffed involvement with more than 20 distinct winged animals and parrots. Get very close to our outlandish winged animals amid the free flight appears, wonder as the flying creatures jump overhead and associate with the group of viewers. Iceland water park Dubai covers an area of over 103,000 square meters, expansively themed on Penguins as their homeland with the capability to have over 10,000 visitors. You can have an exciting experience at the ‘Penguin Falls’, it is the largest man-made waterfalls in the world. Furthermore, the Wave Pool is the biggest pool in the region. Also, there is a Lazy River with the length of 400 meters. Moreover, reduce your adventure desire at Rocky polar Mountain which offers more than 25 thrilling water slides. Enjoy the famed Coral Reef which provides a memorable experience of scuba dive. You can experience the Mother Nature at its best. The hypnotic Hajar Mountains and the Arabian Gulf will make you admire this place because of its beauty of the mountains. There is a restaurant named Snow Castle Restaurant which offers the fine dining with an amazing view of the park. 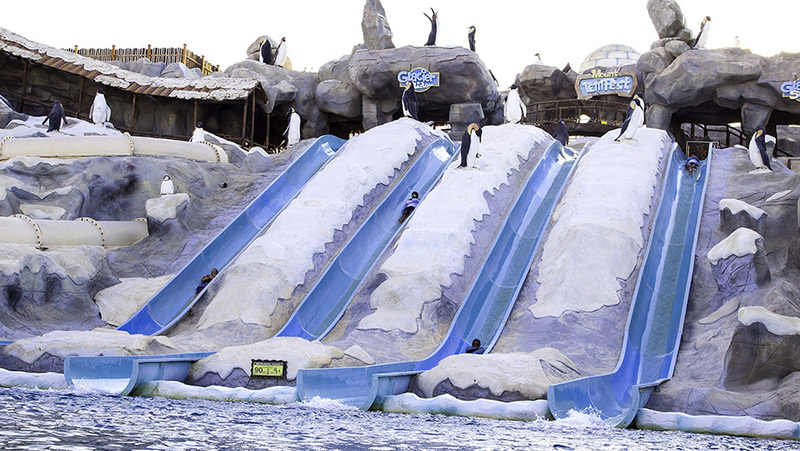 Therefore, Iceland Water Park Dubai comes in the top water parks list in the world.